We were able to get to 3 of the four wild card teams during our September blitz of playoff contenders. Today we complete that foursome by taking a look at the San Francisco Giants Madison Bumgarner. Madison Bumgarner has been a steady starter for the Giants each of the last four seasons taking the mound 30+ times annually and collecting 200+ innings. This season the Giants suffered through Tim Lincecum's continuing inconsistency and Matt Cain's injury but were able to count on MadBum to become their Ace. The 25 year old southpaw made his 2nd all-star team in 2014 while reaching career highs in Wins, Innings and Strikeouts. On Wednesday night The Giants send Bumgarner to the mound versus the Pirates in Game 163. I look forward to the NL half of the playoff bracket beginning, the Phillies may not be a player in this years postseason but that doesn't mean there won't be some great baseball. This is the Phungo Hall of Fame Index for Willie Mays Cards. Today marks the 60th Anniversary of one of the most iconic moments in Baseball History. 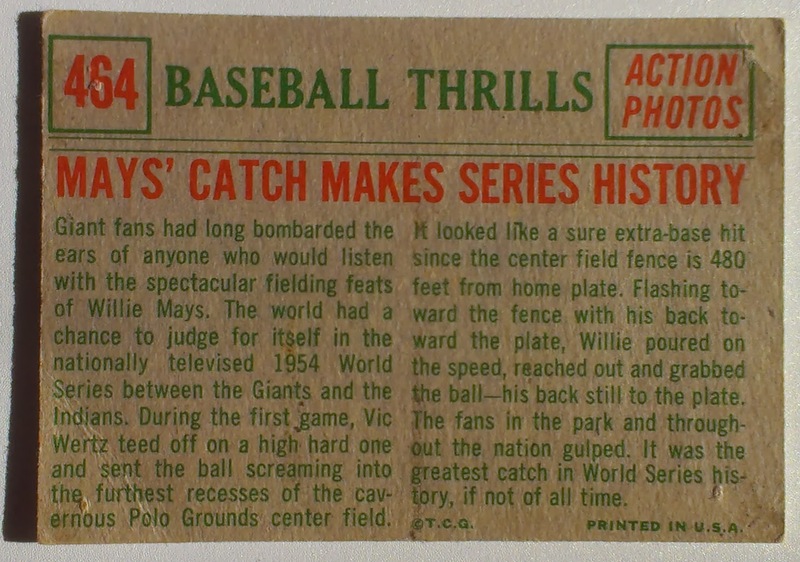 Willie Mays' play which is now simply known as "The Catch"
The Catch helped the Giants maintain an 8th inning tie in Game one of the 1954 World Series. The Giants won the game in the 10th on a Walk off Home Run by Dusty Rhodes. Five years later Topps honored the moment as part of their 1959 Baseball Thrills Subset. The story of the catch is recounted on the cards b-side. The Original Artwork for this card was posted on Twitter by Baseball by BSmile. For more information on this card as well as the other four Willie Mays cards in 1959 Topps check out our 2011 Willie Mays Quartet posting here. Thanks to many outlets on Twitter that reminded me of today's Anniversary. This is an Index of our series on the 1959 Topps Baseball Thrills Subset - The original postings ran in 2014. The Phily Show is all weekend but Team Phungo has been to busy to pitch the event. Hopefully we will be able to make an appearance on Sunday. If you think you will be at the show let me know via email or twitter - would love to meet fellow collectors. Peconic Beverage Great Craft Beer selection in an area that doesn't appear to have great takeout beers. Montauk - Might be better in season, but felt like town trying to survive. 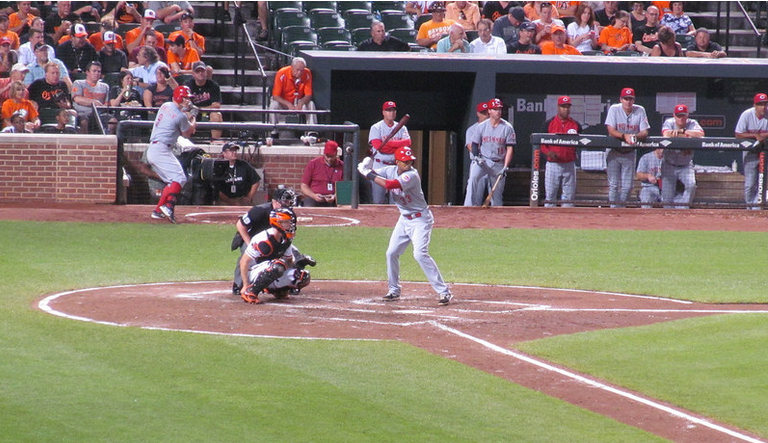 Sunday Night Baseball is in St Louis monitoring the Cardinals as the host their Division foe Cincinnati Reds. The Cardinals are the reigning NL Champions and once again find themselves atop the NL Central. As our Playoff Contenders series rolls on tonight we take a look at veteran Matt Holliday. There are some players I dislike for good reason, off the field problems, Hot Dogs, the play for the Mets etc. Then there are players I have disliked for a decade and can't remember why. Matt Holliday falls into the latter category. I can't for the life of me figure out why I dislike him. Maybe it is East Coast bias, Maybe I think of him as an overrated Rockies player, Maybe he got a game winning hit vs the Phillies that I never shoook, Maybe somebody I thought knew nothing about baseball mentioned him favorably - probably a combination of the above. Regardless the 34 year old outfielder has carved out a nice career. If he stays in baseball for a couple more season he will likely enter the 300 HR and 2000 Hit clubs. The six time All-Star has won a World Series (2011 Cardinals) and participated in 2 other Series. He has 59 postseason games under his belt with a healthy 12 playoff Homers. Matt Holliday is not a Hall of Famer, but if he is fortunate enough to play until he is in his 40s, he could become one. The last couple of years Topps as put the All-Star related cards in Update or TS3 as I sometimes refer to the set. Baseball cards are forgotten by most collectors by the time S3 arrives, they have either had enough or moved on to football or other interests. I have an affection for the last set of the annual flagship. It typically contains an eclectic mix of rookies/long awaited prospects, cup o coffee players, and veterans in odd unis - that is all good fun for me. I never build the set, but do enjoy the few odd packs I pick up. Each of the eight participants in the 2011 Home Run Derby hosted by the Arizona Diamondbacks is represented by a TS3 card. Robinson Cano (Card #US299) won the competition over Adrian Gonzalez (#US 126). 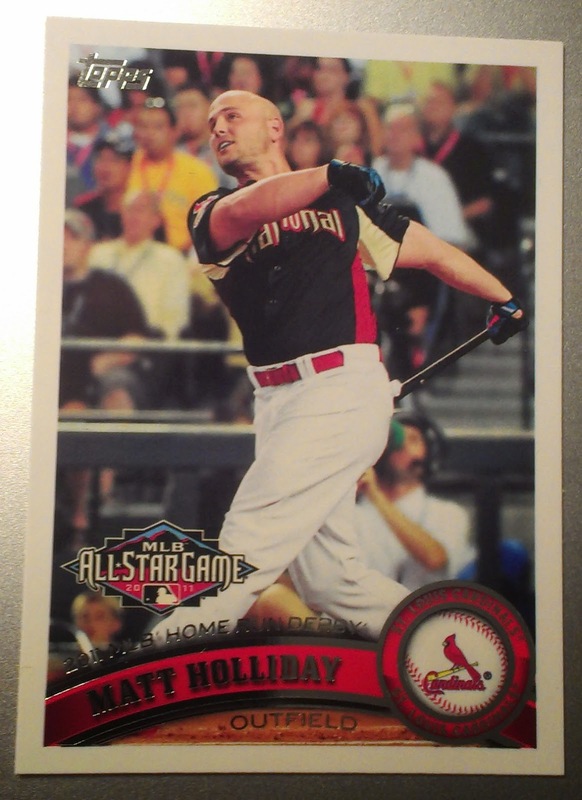 Matt Holliday had 5 Homers in round one but was eliminated via tie-breaker to Prince Fielder and David Ortiz. Fifty years ago on Sunday the 1964 Phillies entered the day 6 1/2 games up with 12 to play. The Philies faced the Reds that day sending Art Mahaffey to the mound. He pitched very well taking a shutout into the 6th inning and then something happened. With 2 outs, Mahaffey faced future Hall of Famer Frank Robinson with a runner on 3rd base. Chico Ruiz, the runner at 3rd base, broke for the plate. Mahaffey's pitch went wide and Ruiz scored. It was the only run the Reds scored. Unfortunately for the Phillies they were shutout by John Tsitsouris. It is the game that started the 1964 Phillies famous collapse -The first of 10 consecutive losses the club would endure. The Phils World Series aspirations evaporated during those two weeks, The St Louis Cardinals took the league by 1 game over the Phillies. 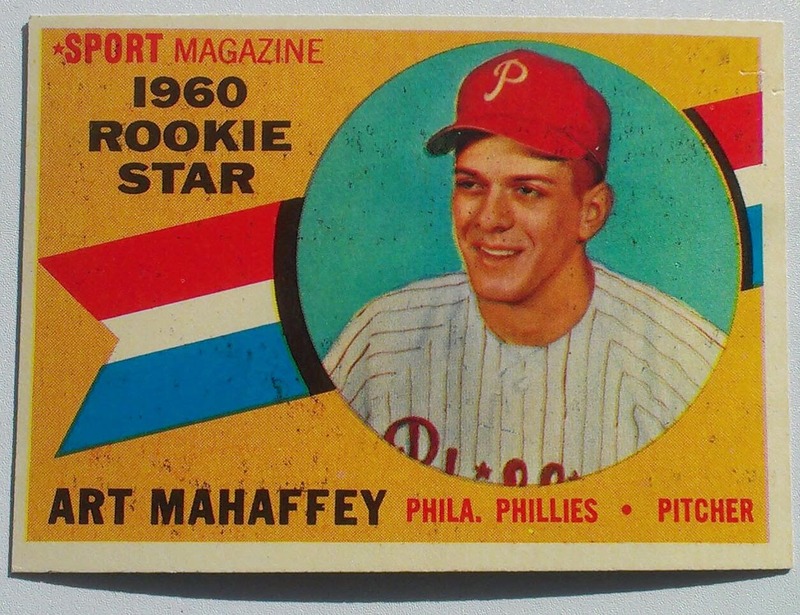 As part of our 1964 Philles coverage you will get to see this Rookie Stars card a couple of times. 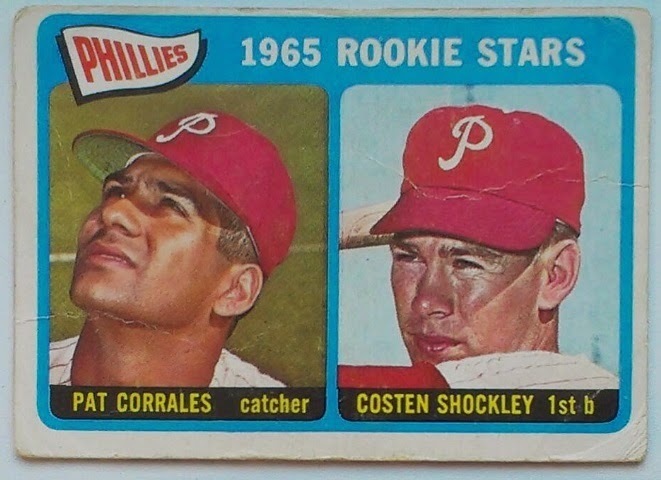 Today we look at the lesser known side of the card which belongs to Costen Shockley. As noted earlier in the week the Philly Show will be in Valley Forge the weekend of September 26-28th.While most of the autograph portion of the show is focused on No-Hit pitchers, there are a handful of additional guests that will be part of the festivities. Costen Shockley was signed by the Phillies out of a nearby Georgetown DE high school. At the age of 22 he made his Major League debut with the 64 Phillies squad. He only got into 11 games with the team, during the off-season Shockley was involved in a trade to the Angels that returned Bo Belinski. 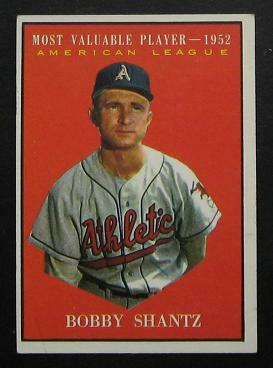 Shockley made the opening day roster for the Angels but struggled at the plate. In June the Angels decided to send Shockley to the minors an assignment he refused. That was it - at the age of 23 Costen Shockley was done playing baseball. He returned to his native Delaware and worked in construction until his retirement in 2005. He has no regrets about moving on from baseball and his fortunate to have several family members that have played the game at several different levels. His son Costen Jr was a member of the 1981 Senior Little League championship team. Costen Sr is a member of several local sports Halls of Fame including the Delaware HS coaches and Delaware Sports Museum HoF. The Phillies disappointing 2014 season is coming to a close. They are in the middle of a last west coast swing which will take them on a rare trip to Oakland. The A's have had a tough September but appear to still be in line to get into the playoffs which gives us another opportunity to add to our playoff contenders feature. Josh Donaldson may be the least noteworthy superstar in Baseball. He is a WAR darling who finished 4th in the 2013 MVP voting and followed that up with his first All-Star appearance this summer. His Batting Average has slipped this season, however, Josh Donaldson continues to hit for power. He is also leading the AL in Defensive WAR which has helped him maintain a 7.1 combined WAR which only trails Mike Trout among folks in the Junior Circuit.. 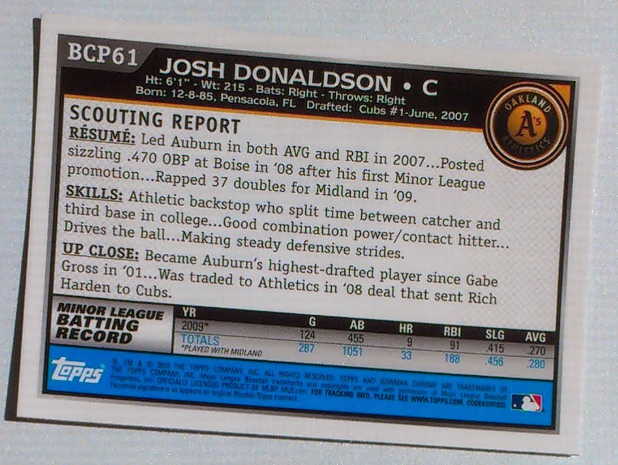 I present the flip side of Josh Donaldson's card here to note the position. He is a an all-star 3rd baseman now but he was drafted as a catcher, where he played the majority of his games prior to making it to the majors. The position switch has definitely worked - Donaldson has hit better than expected and he has been a standout defensively. This is a bit confusing but the first 110 card of Bowman Chrome Prospects are Inserted into 2010 Bowman, while the latter 110 cards are in 2010 Bowman Chrome. This is all confusing to me and I am sure other colletors. While I do enjoy following prospects, I am not a real prospect collector - Bowman falls into that weird nether world of stuff I am a baseball fan of, but not a collecting fan of. The weekend of September 26-28 The PhillyShow returns to the Valley Forge Convention Center (and now casino) for one their tri-annual visits. As time marches on the card show is becoming more of an autograph show which I have some quibbles with, but I won't let that keep me from mentioning a few guests. This edition of the autograph portion of the show features a no-hitter theme. Roy Halladay, Tommy Greene, and Terry Mulholland are all scheduled to appear - For a mere $3000 you can get special VIP access to a private autograph session with five of the Phillies No-Hit pitchers. One of the guests included in the No-Hit Quintuplet is Rick Wise. I was a bit surprised to find out that Wise made his debut with the 1964 Phillies. He and Jim Bunning are both members of the crossover between the handful of 1964 Phillies and No-Hit pitchers that will be at the show. Rick Wise and Jim Bunning bare a connection in no-hitter history. As a rookie in 1964 Rick Wise made his second career start in the latter game of the Double-header in which Jim Bunning pitched his perfect game. A mere two days past the 7th anniversary of the Bunning Perfecto, Rick Wise would throw his own No-Hitter, and it was done in spectacular fashion. Most importantly, Wise shut down a star laden Reds line-up that featured 2 future Hall of Famers (Johnny Bench & Tony Perez) and MLBs all-time hits leader Pete Rose. Wise also hit not one but two Home Runs that day. He accounted for 3 of the Phils 4 runs in the 4-3 victory. Wise did get to the World Series but not for the Phillies. As most folks know he was traded to the St Louis Cardinals for Steve Carlton - he was later traded to the Boston Red Sox. As a member of the Bosox Wise got the W versus the A's in the deciding game of the 1975 ALCS. In the ensuing World Series Wise was awarded the Win as a reliever for game 6 - The legendary Carlton Fisk game. Following his playing career Wise stayed in baseball holding various coaching positions in the A's organization. He also coached in the Independent Atlantic league for the nearby Lancaster Barnstormer. Wise retired from coaching in 2008. 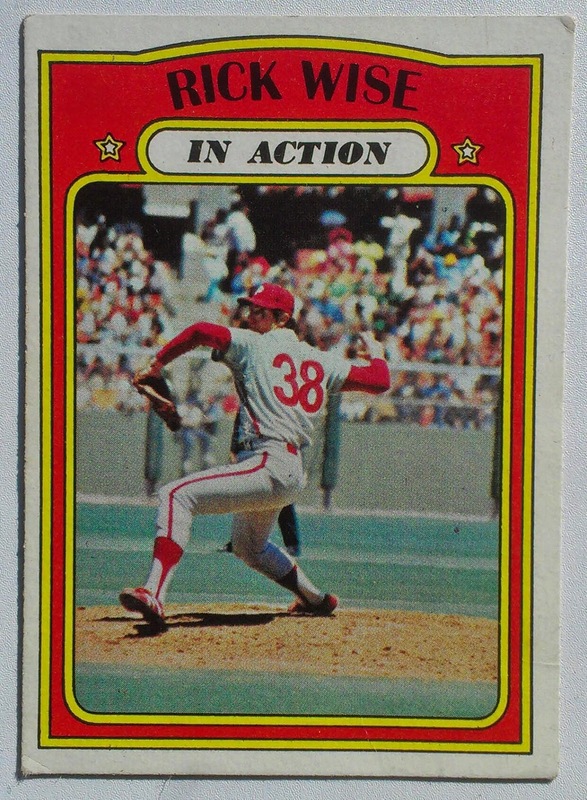 The In Action Sub/Insert Set consisted of 24 cards in 1972 Topps that Paralleled a base card of the subject. In 2011 the late Chris Stufflestreet authored this post that summarizes the card backs associated with the 1972T IA cards. 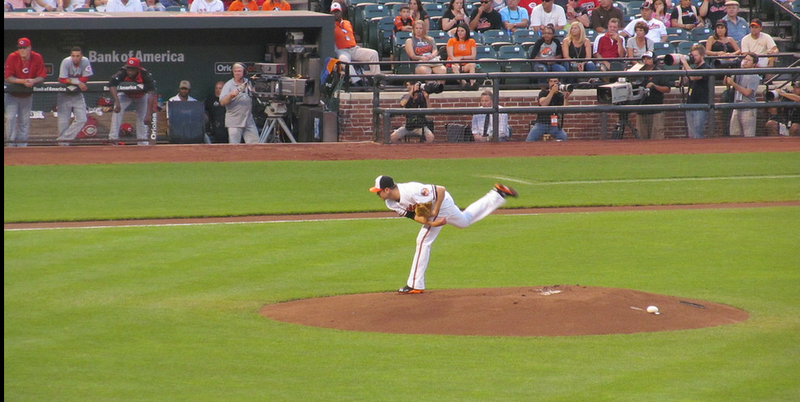 The Orioles host the rival New York Yankees on Sunday Night Baseball. As part of both our SNB and 2014 Playoff Contender's series tonight we take a look at long time Orioles outfielder Nick Markakis. There he is Nick Markakis right in the middle of a couple of New Yorkers and a bunch of Phillies. He has made his way onto the list by keeping himself healthy. Since 2006 he has played in 147 or more games every season but one. The one year that Markakis did get injured was 2012 and it cost him his one previous shot at postseason play. Outside of an exceptional 2008 season none of Markakis' individual seasons have been outstanding, Markakis has been quite steady. He has put up double digit homers every year and never had an average below .271 - career BA .290. In 2008 Markakis Led all AL players and position players in WAR (7.5) yet he didn't get a single MVP vote. The Orioles were dreck that year (93 losses), but teammate Aubrey Huff got MVP votes (32HR vs 20 for Markakis, 108 vs 87 RBI). Huff's role as a DH limited his WAR to 4.1. Award winner Dustin Pedroia was 2nd to Markakis in AL WAR and AL Position WAR. The offensive WAR category went to A-Rod - Pedroia finished 5th but was tops among players that made it to the playoffs. Note the BoSox were not division winners in 08. They got in on a Wild Card behind the Rays, then lost to the Rays in a 7 game ALCS. Propaganda is a 30 card insert set of 2009 Topps Update. I believe there is one card for each team, the Phillies representative is Ryan Howard. The card design which evokes the propaganda posters of the 1940 was developed by Chris Speakman, Speakman continues to do a lot of work with MLB and has a number of Seriagraphs and Posters for each MLB team. His Phillies subjects include Howard, Chase Utley, Cliff Lee, Roy Halladay, and Chooch. The Uncorrected Error on the above Markakis card is that Orioles establishment year. The O's only date back to 1954 not 1894. There is a second inception date for the Orioles but that is Pre-O's Pre-Browns Milwaukee Braves who played their inaugural game in 1901. Regardless that ain't 1894 either. I am not sure where the 1894 date originates other than it was propagated from a similar card, except my hack research failed to uncover a team that joined baseball in 1894. The error highlights an inconsistency in the propaganda set. Andrew Bailey's Athletics card specifies 1968, the year they moved to Oakland, rather than 1901 the year that the Philadelphia A's were a charter member of the American League. However, the crosstown Giants card of Tim Lincecum does not specify the year the team arrived in San Francisco, 1958. The card specifies 1883 which is the year they joined the NL representing New York as the Gothams - their nickname prior to becoming the Giants. For Patriot Day 2014 we are posting a USA Baseball Card. This is part of my USA baseball album, but could be part of my Phillies collection. Yes Dave Stewart did spend about 15 minutes playing for the Phillies in the middle 80s. This was in the era just prior to Dave Stewart becoming a perennial Cy Young candidate and dominant postseason pitcher. 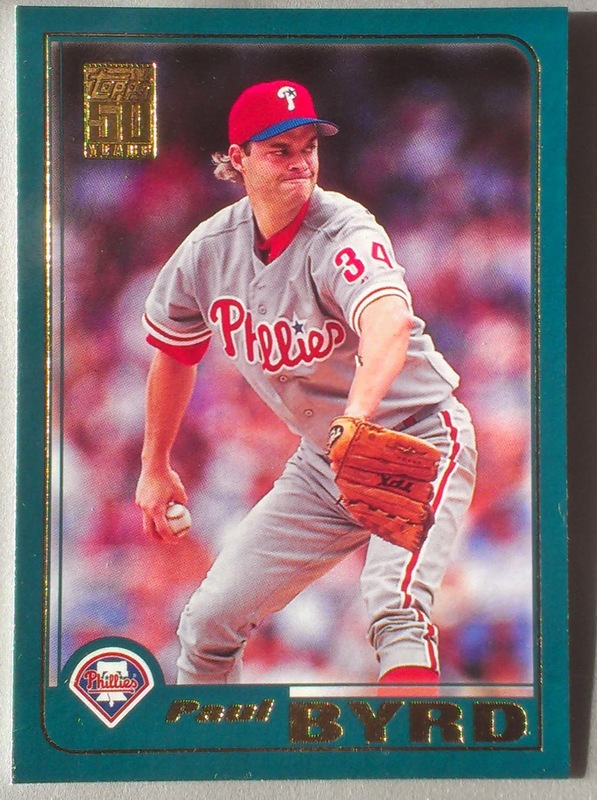 During the 9 month period that Stewart played with the Phillies he pitched 12 games all in relief and sccrued a 6.48 ERA. For obvious reasons the Phillies released Dave Stewart. Stewart was signed by the Oakland A's and his career changed. Between 1987 and 1991 he was a top 4 finisher in the Cy Young voting. In 1987 he led the league in Wins, twice during the aforementioned four year period he led the league in Innings and Complete Games. In 1988 He was named the World Series MVP in the Earthquake Series. It was one of 3 World Series Ring Dave Stewart would win. The first was as a relief pitcher for the 1981 Dodgers, the other was versus hte Phillies in 1993. In addition to the WS MVP Stewart also collected postseason honors in 1990 and 1993 when he was named MVP of each of those ALCS. Overall Dave Stewart was 10-6 with a 2.77 ERA pitching 133 innings across 6 postseason runs. Patriot day is also known as a Day of Service and Remembrance conceived to help honor and remember lost love ones and those who were affected by that loss. Dave Stewart had some missteps off the field early in his career, but in retirement has become an important contributor to his community. He is a strong supporter of the Oakland Boys and Girls Club and other Youth oriented organizations in the bay area. Each year the Oakland A's present a team member with a Community Service Award that is named for Dave Stewart. Reliever Sean Doolittle won the award in 2013, Doolittle is active with Veteran's Afffairs offices in Palo Alto and nationwide. I found no record of a 2014 award recipient. The Phillies are hosting the cross state Pirates for a for game set this week. This seems an appropriate time to add the Bucos to our Playoff Contenders Preview feature. The player that we are looking at today is Birthday Boy Neil Walker. The Pirates picked Walker with the 11th overall pick of the 2004 draft. Walker was a standout from a Pittsburgh area high school. I am sure this has put additional pressure on him especially early in his career when the Pirates were struggling towards respectability. Walker was drafted as a catcher but the Pirates, perhaps in an effort to get him to the majors quicker, moved him to second base. I think this may have been a disservice to the player, but it may have been necessary for the organizaiton at the time. While he has never had an outstanding season, Neil Walker has been steady. 2014 looks to be his best season to this point. He has posted a career high 19 homers, and currently has Career highs in both On Base Pct and slugging. Walker turns 29 today which means he will have one of what I consider a players prime years (agewise) (29-32) behind him. If the Pirates are to hang onto Walker I would think they would like to get a bit more out of his prime seasons then they have gotten from him in his first five seasons. The full name of the set is Bowman Draft Picks & Prospects Baseball. Add to that the Insert name of Futures Game Prospects Set and you have a mouthful. I have chosen to abbreviate both handles coming up with Bowman Draft for the set and Futures Game Prospects for the insert. That is still about 8 words too long, but it will need to do. In 2006 the Insert set featured 45 cards of Futures Game participants. The game was hosted by the Pirates that summer and was likely one of the first times that Neil Walker appeared in a professional game at PNC park. The Phillies sent two players to the game Gio Gonzalez and Carlos Carrasco, Other notables included in the 2006 Set are Pablo Sandoval, Hunter Pence, Joey Votto, Troy Tulowitzki, Carlos Gonzalez, Homer Bailey, Alex Gordon, Stephen Drew, Ryan Braun, and the late Nick Adenhardt. 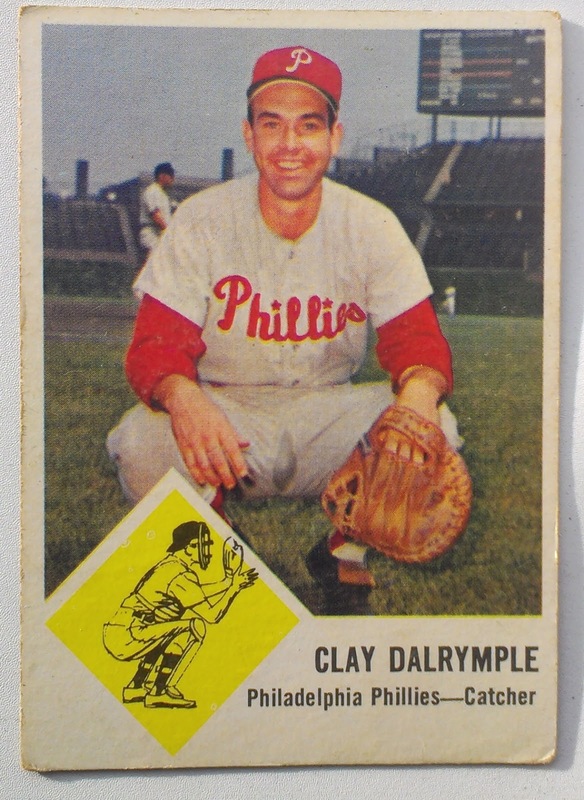 Tonight we return to our 1964 Phillies feature with the Phillies Catcher Clay Dalrymple. Prior to 1964 Dalrymple had a couple of decent offensive seasons as the Phillies full time Catcher. For the 64 campaign Manager Gene Mauch elected to platoon the left-handed Dalrymple with Gus Triandos. The part-time play was likely not the reason, but Clay developed a hitch in his swing and never really recovered. Prior to 1964 during his age 23 through 26 seasons Dalrymple hit 30 of his 55 career home runs. His career BA after those four seasons was .252. He would stick around the league for 8 more seasons as a defense first catcher and would never hit above .245 again. His defensive reputation certainly appears deserved. For his career Dalrymple eliminated a very impressive 49% of base stealing attempts. Three times he led the league in Caught Stealing, Those same three seasons (61, 63, 65) he also led the NL in assists. While he didn't get to the World Series with the 1964 Phillies, Dalrymple did get to play in the Fall Classic as a member of the 1969 Orioles. He was also a member of the 1970 World Champion Orioles, although he was not a part of the postseason roster. In 71 he was on the roster for the O's AL Championship squad but did not appear in any games. Clay Dalrymple now 77 lives in Northern California, He has been married five times - and a Widower twice. His first wife, Celia, died of cancer near the end of his playing career. Dalrymple stayed in contact with major league baseball in various capacities after his retirement as a player. His time with the Orioles include a stint as a color commentator. In 2005 Dalrymple submitted a heartfelt letter to the Baltimore Sun regarding the death of the towns legendary broadcaster Chuck Thompson - Dalrymple commented on the support that Thompson gave him as he began a new career. 1963 Fleer is a set that I am fond of and at various times have considered building. The abbreviated set is a mere 66 cards - Due to a legal action from Topps, Fleer was only able to produce a single series. The series is significant for containing the first Maury Wills card. There are five Philies in the set that run from #50-54. If you want an easy to build Vintage Phillies team set, this may be the one for you, The cards can often be found for $2. My only quibble with the set is the drawing of the catcher in the bottom left. He is clearly demonstrating poor form. You have to get that off hand behind your back, no need to get it busted by a foul tip. This weekend the Detroit Tigers host the San Francisco Giants in an interesting inteleague matchup that features two teams battling for a playoff spot. Tonight the Tigers are attempting to salvage the final game of the three game set to avoid a being swept. The last two years Miguel Cabrera has been the AL MVP, but this year the Tigers offensive MVP is Victor Martinez. At age 35 the veteran DH is batting .335 with a league leading .406 OBP. The former catcher has also provided the Tigers with middle of the order power, logging 30 Home Runs for the first time in his career. It is a longshot, but if Martinez has a big week he could make a run at the triple crown - He is off the pace by 5 points in BA, 7 Homers and 10 RBIs ranking 2nd, 7th and 5th respectively in those three categories. 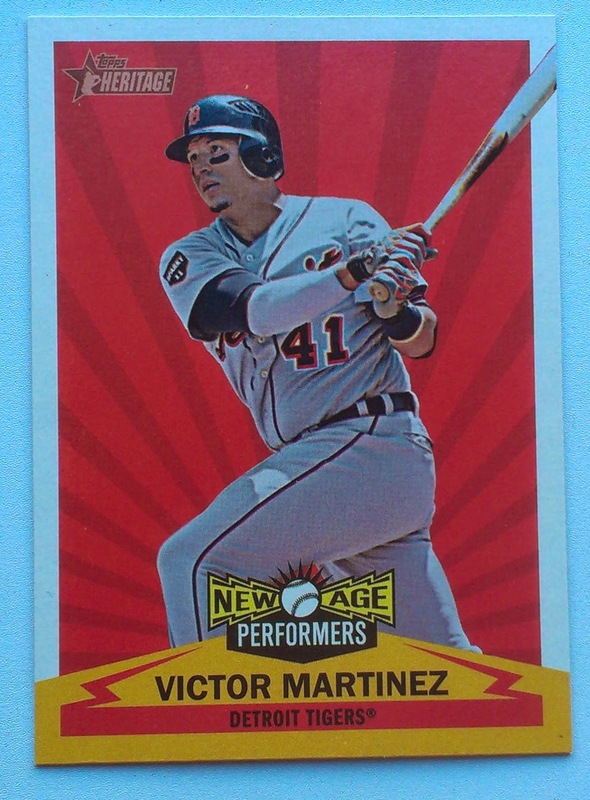 NAP has been a part of Topps Heritage since the set debuted in 2001. The 2012 edition of the insert set consists of 15 cards cataloged by player initials. In additions to Martinez the Tigers are also represented by the aforementioned Miguel Cabrera. The Phillies also have 2 players in the small set, Cliff Lee and Roy Halladay. Sunday Night Baseball Looking at the schedule the Tigers open their upcoming home series with the Division Rival Kansas City Royals with the odd Monday Day game. The scheduling snafu is the confluence of events conspiring against the Tigers. They are important enough to get the Sunday Night slot, however their local football sibling Detroit Lions are playing on Monday Night Football. This adds up to the Tigers playing a late Sunday Night game followed by a quick turnaround for a Monday Day game. This is an index of postings related to 2014 Playoff Contenders. It has been a busy summer and Thursday night I finally made my first trip of 2014 to Camden Yards. The Orioles won the slugfest 9-7 including 6 runs via the Homer. 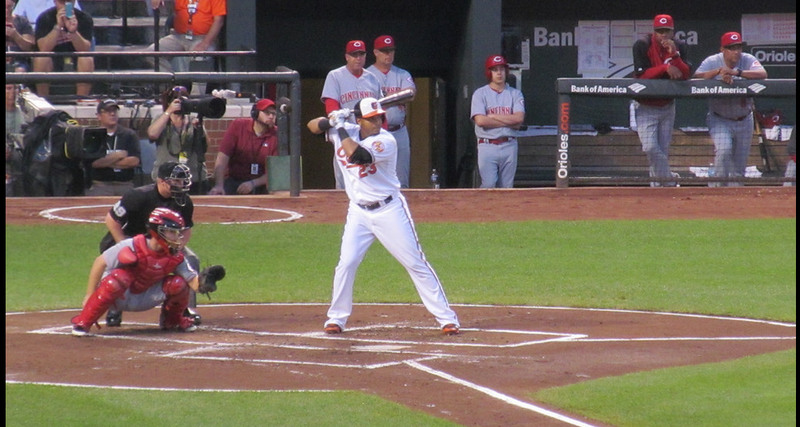 This is Cruz at the plate - This is from the pitch that he would knock out to center for the first of the Orioles 3 home runs. Devin Mesoraco had a big night for the Reds. He was 4-4 with a Homer and a Double with 4 RBI. The Orioles offense spotted Tillman 6 runs unfortunately he was only able to get through six innings and the bullpen couldn't hold the lead. The Reds #12 Prospect (mlb.com) Yorman Rodriquez made his Major League Debut on Thursday night. He was 0 for 3 prior to being lifted for a pinch hitter. It was a bit warm but still more than nice enough for a game. Sadly the O's drew just a touch over 21K fans. They are a first place team, hopefully they will pack a few more in as the playoffs near. Today our 2015 HoF Candidates series takes a look at journeyman pitcher Paul Byrd. Byrd spent 14 years in the Majors, but never more than four with any one club. The two teams he spent the most time with were the the Phillies and their current opponent the Atlanta Braves. During those 14 seasons Byrd racked up 109 wins and represented Phillies on the 1999 Al-Star team. Byrd got into postseason play with four different clubs. The closest he got to the World Series was as a member of the 2007 Indians who pushed the Red Sox to seven games in the ALCS. Earlier in the 07 Postseason Byrd got the W while eliminating the Yankees in the ALDS. An eon ago, probably about the same time the above card was produced, I was going over pitchers in a Fantasy Baseball magazine. The Magazine had a buzz synopsis along with each players projected stat line. The comment associated with Rick Reed, a replacement player in the Mets organization, was "A Poor Man's Greg Maddux". Further down the roster Paul Byrd was listed as "A Poor Man's Rick Reed". So there you have it Paul Byrd was 2 degrees in talent removed from the Hall of Fame. Over the weekend found out via @HighHeatStats that this past Saturday would have been Tug McGraw's 70th birthday. McGraw seemed perpetually young, his 2004 death from brain cancer at age 59 felt so premature. 15 years ago I got to see Tug McGraw speak as part of a baseball exhibit at the Chester County Historical Society, which at the time was a block away from my apartment. As one can imagine Tug was a great speaker, He talked about his days as a starting pitcher with the Mets and as a reliever for the 1980 Phillies. Some of the interesting tidbits I remember are that he pitched against Sandy Koufax. He also batted against him and said that one of his proudest moments was putting the ball in play off of the Hall of Famer. He brought his personal World Series Trophy (the players each get a smaller replica trophy from the league) from the Phillies 1980 World Championship. He also had his 1969 World Series Ring from the Miracle Mets triumph. McGraw explained that he knew it was a Phillies event but that the then current year (1999) was a Mets Anniversary Year and he wore that ring. The following year would be the Phillies 20th anniversary and he would switch rings in 2000. Amazingly McGraw passed both items through the audience. He said he had done this has similar speaking engagements and knew he would get them back. The night of the CCHS event Tugger signed autographs for all in attendance. There was youngster in front of me that had a baseball that literally had the cover ripped away. The boy asked McGraw to sign the ball on the inside of the cover. McGraw mentioned that he had signed thousands of autographs but had never signed on the inside of the horsehide. McGraw signed both poster that accompanied the event and a 1979 Topps Card that I brought. Both autographs contained his trademark smiley face.